Dental Bridge vs Dental Implants – Which is Right For You? Does Tooth Bonding Break Easily? Dental Bonding or Porcelain Veneers: Which is Best For You? Two popular treatment options to replace teeth are dental bridges and implants. While both of these options can be very effective, it is important to be aware of the requirements of each as well as their differences so you can easily select the one that makes the most sense for you. A dental bridge is made up of two crowns with a false or prosthetic tooth in between. The crowns are attached to two healthy, adjacent teeth or implants, which are called the anchor teeth, and help to hold the prosthetic tooth in place. The false tooth is called the pontic. The entire apparatus creates a bridge and fills the gap created by a missing tooth or teeth. In order to install a bridge, your dentist will need you to commit to a minimum of two visits. The first would be to assess your existing teeth or implants and prep them for the crowns, as well as take impressions to make your permanent bridge. You will receive a temporary bridge until the second visit when your permanent one will be installed. A bridge may need to be adjusted after installation to achieve the most comfortable fit possible. 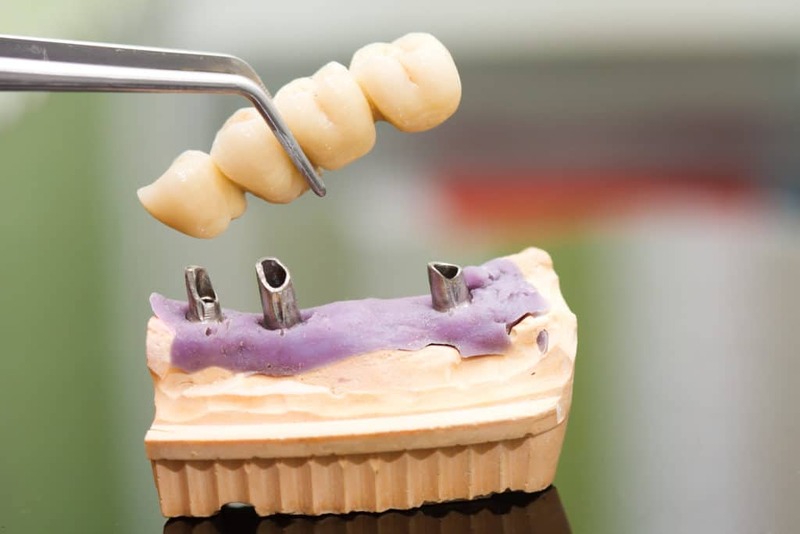 A dental implant is very different than a bridge. Instead of bridging the gap with crowns and prosthetics, an implant is an artificial tooth root that is attached to your jaw bone. A connector, also known as an abutment, is then attached to the artificial root and a custom made crown is attached to the connector. The crown becomes your replacement tooth, held in place by the dental implant and connector. Dental implants requires more time and care than dental bridges. Since the implant is attached to the jawbone, it does require minor surgery. Aftercare may be more extensive with dental implants to ensure proper healing. Your current oral health may dictate which option is best for you. In order to utilize a dental bridge, the neighboring teeth or implants need to be able to support crowns. A dental implant needs a sufficient amount of jaw bone to be effective. Schedule an appointment with our dentist to have your teeth, gums and bone assessed. Dental bridges can last anywhere from five to fifteen years. Dental implants, on the other hand, may last twenty-five years or more. The longevity of your dental device depends on your care and maintenance once your procedure has been completed. Bridges and implants need to be cleaned and cared for just like your natural teeth. Cost can be a deciding factor for many people. Dental bridges vary in cost depending on your location, the materials used for the crowns, how many teeth need to be replaced and more. That said, dental bridges may cost significantly less than implants. A single dental implant may cost up to $7,000. However, the cost will depend on many factors including how involved the surgery is and whether or not bone grafting is needed. Consult our experienced dentist to evaluate your current oral health and achieve the best possible outcome. At EVDP, our team of professionals will listen to your goals and concerns and work with you to restore your teeth to their optimum health.